New York, NY: Houghton Mifflin Harcourt, 2017, 304 pp. Over the past decade, a tool has emerged that enables very precise editing of the human genome, bringing with it tremendous value for research. Yet this gene-editing tool, called CRISPR, also generates worries that society may not be able to control its use and that it may deliver significant harm by allowing scientists to reshape the very basis of life. The tool, which enables scientists to inexpensively manipulate targeted bits of genetic code with relative accuracy, could have a broad range of applications. These uses include treating human genetic disorders, breeding new plants and animals, and controlling disease-carrying insects or invasive species. A Crack in Creation tells the story of this revolutionary technology from the perspective of biochemist Jennifer Doudna and one of her former graduate students, Samuel Sternberg, who were central figures in the technology’s development. This book has much to like: Charismatic authors who are indisputably leaders in CRISPR. A story of the excitement of discovery in science, and related stories of the discovery of social issues relating to science. Lively writing that is wonderfully clear and pulls the reader along, eager to learn what’s next. A Crack in Creation shows why CRISPR is so compelling as a tool for gene editing, with prospects for groundbreaking medical and agricultural advances. And it shows why both the public and scientists should think carefully about CRISPR’s uses and whether there should be limits on the research. The book is more important and far more nuanced than another tale told by a scientist about his important discoveries and their impacts, James Watson’s Double Helix, the 1968 autobiographical account of his and Francis Crick’s discovery of DNA’s structure. A Crack in Creation will (or should) be widely read and widely discussed, but also widely critiqued, if we accept the authors’ call for public engagement and communication. First a note about authorship: The book is purportedly written by Doudna and Sternberg. Yet the voice is entirely first-person Doudna, with Sternberg remaining largely invisible—more like a ghostwriter—even though he was there during part of the laboratory work being discussed. The approach nonetheless works because the writing is vibrant and comes across as authentic and personal in a way that will undoubtedly attract a lot more readers than the usual secondhand narratives by science writers. Sternberg deserves congratulations for being willing to fade into the background. And it makes sense to refer to this book as Doudna’s because it is told from her point of view. The first part of the book is about the science of CRISPR, or what is more fully called the CRISPR-Cas system. (CRISPR stands for Clustered Regularly Interspaced Short Palindromic Repeats, which refers to repeated sequences of genetic code; Cas refers to a CRISPR-associated enzyme that can be used to cut DNA in specific places.) Doudna offers vignettes about her own development as a researcher, moving from doing work on RNA to discovering CRISPR. She explains step-by-step the reasoning and process of discovery in her lab, including key moments along the way. This discussion shows the process of doing science, including the need to draw on expertise from many different contributors, and the way that the principal investigator recruits and benefits from many others. She names these other researchers, and gives insights into steps that proved more elusive than she had initially thought. This part is so well written and clear that it is a pleasure to read the story of how Doudna followed various twists and turns to triumph and become a leader in the CRISPR work. She probably intended to be humble and to show that science is teamwork. Yet her personal excitement at thinking of herself as the discoverer comes through as well. The second part of the book shifts to social impacts and issues. Here Doudna moves from the swirling scientific world of CRISPR’s discovery, where she was interacting with and learning from many other scientists and colleagues. Here she becomes the leader, with the implication that she sees herself as the one who caused the storm. She seems to believe that she is the one who should lead the way through that maelstrom, to provoke and promote public discussion that can inform decisions about when and whether to use CRISPR. This seems less a matter of hubris on her part than a result of her newfound and admirable recognition that scientists need to take responsibility for the social applications of their work. This part becomes a bit disappointing, though. Whereas earlier in the book Doudna explains how important it was for her to read the literature and learn new scientific information and tools, here she seems to feel that intuition is a valid approach for social issues. She feels excited by the hopes for curing disease, but queasy about the possibilities for human germline editing—that is, editing the human genome so that the changes are heritable. She gives no evidence that she felt the need to immerse herself in the professional literature related to bioethics, policy, or law. Why not? She seems motivated by good intentions to become “engaged” with public issues, but she could learn from many others who have thought deeply about these concerns. Doudna discusses a variety of ways CRISPR has been or can be used. The language becomes exaggerated: “It amazes me to realize that we are on the cusp of a new era in the history of life on earth—an age in which humans exercise an unprecedented level of control over the genetic composition of the species that co-inhabit our planet. It won’t be long before CRISPR allows us to bend nature to our will in the way that humans have dreamed of since pre-history.” Really? Then follows a litany of ways the tool can be, and in some cases has been, used to improve agriculture, in both plants and animals. She describes uses of CRISPR that seem close to being able to edit out human disease-causing genes. All this amazing work is good, well-intentioned, and clearly going to improve human lives, Doudna suggests. Yes, some people worry about genetically modified organisms—but those critics are misguided or uninformed. “It’s easy to get caught up in the excitement,” she writes, and she clearly has. These are “some of the most incredible developments in medical science I’ve ever seen.” In sum, “I am extremely excited and enthusiastic about virtually all the phenomenal progress being made with CRISPR—save for the advancements on one front.” The energetic writing makes the reader enthused as well, and this section is fun to read, although surely not everybody agrees about what is good and even about what is possible when it comes to gene editing. The book then moves into what is effectively its third section, focused on uneasiness regarding CRISPR’s use. Doudna acknowledges that other people have different points of view, but she is confident in her own. She feels queasy and worried, and therefore suggests that we all ought to be concerned about one particular kind of research: editing human germlines in ways that will affect future generations. Doing such research is wrong, she argues, or at least we aren’t ready for it yet. Many other people agree with her, and they often offer clearly articulated reasons. But that is not the case here. The fact that Doudna does not offer any of her own well-developed reasons, or ground the discussion in the considerable professional scholarship that exists, is a missed opportunity. Instead of providing reasons for being concerned about germline editing, Doudna gives us more stories about her own leadership in promoting public discussion. She surely does not mean to suggest that she single-handedly led the way to meetings of the National Academies or other smaller conferences that explored these issues, but an ungenerous reader might read it that way. “Had I created a monster?” she asks, and then answers with reassurance that she has also created a moral response. Yet here is another lost opportunity to do more than exhort scientists to engage in public discussions of the kind that she is organizing. She could help explain what would count as successful communication and engagement, and how to know whether the effort is succeeding. Doudna does not have a clear framework, and does not seem to feel it necessary to seek one, for help in guiding effective communication with the public. Are scientists supposed to talk at citizens, and then let the highly flawed process of policy-making prevail, no matter what? Are researchers supposed to try to guide the public to the “right answers,” which presumably are the ones they hold themselves? Or should they somehow listen to public concerns and try to take those into account when deciding what research to do? Does public engagement about science work in both directions? What is the nature of this communication and the “public involvement” that she considers critical? Doudna points to the work of the historian and bioethicist J. Benjamin Hurlbut, whom she quotes as saying that “Imagining what is right and appropriate for our world—and what threatens its moral foundations—is a task for democracy, not for science.” But Doudna worries that society does not understand science, and therefore it is up to scientists to educate the public. She, as a leader of CRISPR science, feels compelled to become the communicator about it to the public. To do this effectively and reflectively takes more than good intentions, however. And her failure to understand or develop a framework for what should count as thoughtful public deliberation about how, when, where, and under what conditions to carry out discussions at the intersection of science and society feels like yet another lost opportunity. We can applaud Doudna for her willingness to step out of her lab and engage the public. We might wish that she had been more forthright about her and her coauthor’s financial interests in several companies that may well benefit from expanded public awareness and discussion. But we can be glad that Doudna wants to help shape public discussion and engage in deliberation about CRISPR science and its applications. This is not, as the book jacket suggests, the first time since the atomic bomb that scientists have been concerned about the social consequences of their work. Recombinant DNA, which Doudna mentions, cloning, and human embryonic stem cell research all provide recent examples. CRISPR is not an atomic bomb, Doudna did not invent the tool by herself, and she will not be the one to develop most of the innovations built on CRISPR technology; nor will she be the only one to lead continued public discussions about its uses. But aside from the hype and some missed opportunities, her book offers a beautifully written and compelling story. It presents the science in a wonderfully clear way and will surely be required reading in the public discussion for which it rightly calls. Jane Maienschein is the director of the Center for Biology and Society at Arizona State University and Fellow at the Marine Biological Laboratory in Woods Hole, Massachusetts. She is the author, most recently, of Embryos Under the Microscope: The Diverging Meanings of Life (2014) and coeditor of Visions of Cell Biology (2018). Maienschein, Jane. 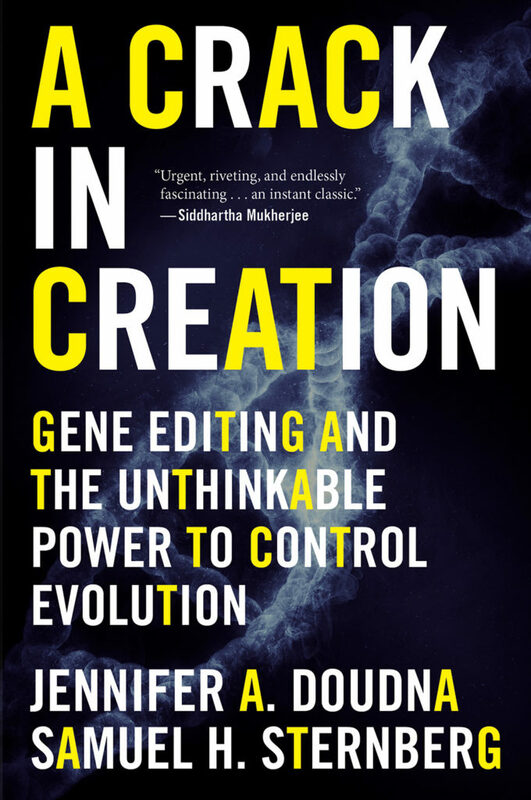 “A Task for Democracy.” Review of A Crack in Creation: Gene Editing and the Unthinkable Power to Control Evolution, by Jennifer A. Doudna and Samuel A. Sternberg. Issues in Science and Technology 34, no. 3 (Spring 2018): 93–95.